Welcome back to part 2 of Bootcover Land! Todays topics include, finding your materials, preparing your mockup, and sewing your bootcover. All the steps inbetween creating and attaching to your shoes! Arrrr we be makin' my boots! Bootcovers can be made of many types of materials. I VERY strongly suggest using a thicker material over a thin one - like canvas vs broadcloth. You need something heavy, sturdy, and something that can definitely take a beating. You're going to be walking around in these, most likely at convention spaces larger than say, your living room. 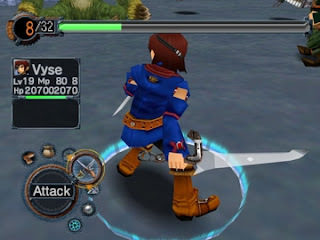 So taking a look at my picture here, we can see that Vyse is a pirate. Pirates tended to wear leather boots, as he's got that "adventurer" sort of feel. That and if you look at the reflections on the darker part of his boots, it looks a little shiny, so it's made of a slickish material. For my shoes which I am choosing "leather" I don't plan on using real leather. You can, but it seems like a waste of money to me. I'd much rather just pick up a nice upholstery pleather and call it good. NOTE: Upholstery pleather tends to be pricey. Either wait for a sale or a coupon for your local craft/fabric stores, or go searching their redtag/bargain bin areas. I can usually estimate how much fabric I'll need visually (smaller pairs of shoes/boots will usually take up to maybe 1 yard of 60" upholstery pleather. And that's with room for extra bits and things allotted), but if you can't, I highly suggest making your mockup first THEN shopping. A mockup is the "rough draft" of your sewing project. It's something that you can write all over, cut to pieces, and not worry about screwing up because it's made with some fabric you really don't care about. 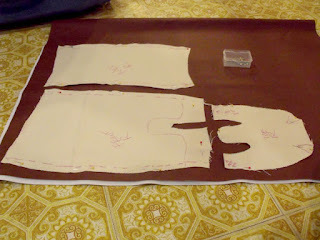 I try to use thicker fabric for mockups like boots - it'll act similar to the pleather I'll be using. Unfortunately, I was bad and didn't take a lot (read: any) of my mockup process, but I will be drawing some pictures for you ASAP (once my arm stops being fail), and posting them here. Also, everybody's shoes will be different than mine. 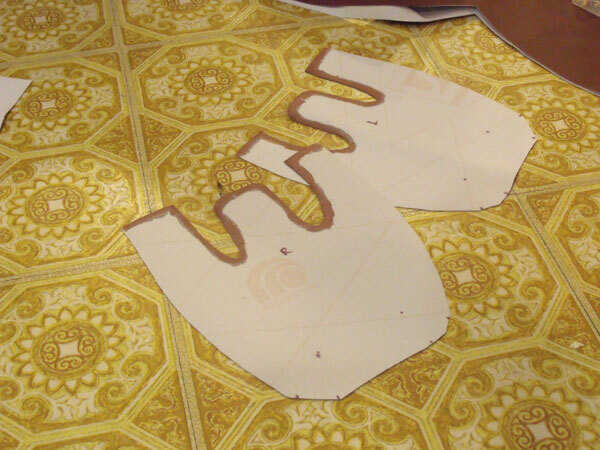 Play around with the fabric until you get it to be the shape you want. For mockups, I will usually start with putting the shoe/boot/footwear on, and then sandwiching it between two layers of mockup fabric. I pin down my leg at the seams I desire. Often times, this will lead to a seam going down the front of the boot, and the back. This is not usually much of a problem for rounded toe boots, or the like. Vyse was a little different. The toe shape of his boots was a little bit more square than I have to work with, so I needed to pad it out. Used some "car top liner" to create the padding. 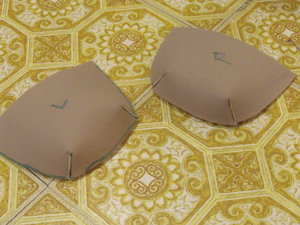 because the shoes have a square toe, I added two "darts" at the toe edge to give it that rectangular shape. Yes. Make sure to label ALL your pieces R & L.
You WILL get confused if you don't. Looking at the shoes, I also realized, that having the seam down the center wasn't going to work out so well. I created a mockup piece to match the front cover of the boot (it'll get covered up by his other details later). After copious amounts of finagling and swearing at my machine, I had pattern pieces to work with. NOTE: ALWAYS write on your mockup fabric - front, back, sides, what foot (R or L) you were working on. The pieces will NEED to be reversed for the other foot. 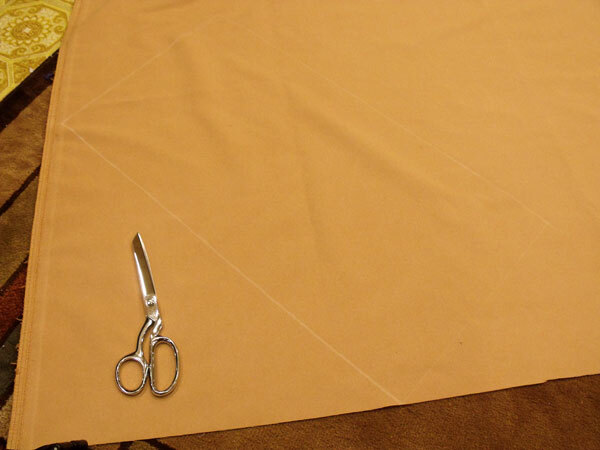 Before you can sew, you need to cut out your fabric. Put your pieces as close as possible. Carefully lay out your pieces on your pleather (or fabric of choice.) If you use pleather, make sure to pin the fabric in your seam allowances (that part that is the flappy bits on the inside of your piece). Pleather does NOT give, and if you puncture holes all in it, there is a healthy chance they'll STAY there and you'll have a garish looking hole in your costume piece. NOTE: I keep labeling everying R or L! Before sewing, always make sure your pieces are prepared. I did not want to have to sew an edge on this pleather, so I managed to find a copic/alcohol based marker (NOT a permanent marker, they do weird things) and I colored in the edges that will most likely be seen by people. This also helps with that "looks like actual leather" thing too. This was Bootcover Try #4,685. Okay, actually it was about Try #4. Lots of swearing was involved. The bootcuffs were something of an entirely different beast, and it took me at least 4 SEPARATE tries to finally get them to "not fail" quality and "good enough for jazz". Seeing as how in both the pictures and the game, they are INCREDIBLY thick, I needed to use padding. I chose "car top liner", and realized after a few failed attempts at math, that I just needed to do separate strips and layer them. I went through a lot of this crap for these cuffs. Thank goodness JoAnn's had a sale on upholstery stuff. 1.) Math late at night = FAIL. 2.) Cartop liner only goes through your machine with the fabric sides out. Otherwise, it bunches, and gets eaten by your machine. 3.) Many layers of cartop liner does not go through your machine as well as one would like. 4.) Take it slow when sewing all the pieces together. Otherwise your machine makes weird sounds. 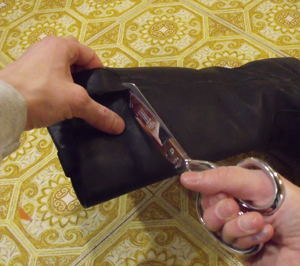 NEXT UP: Attaching your bootcover to your boot (and how not to get get high off the fumes), and then finishing your boot! Two words that can ring fear into the hearts of any cosplayer out there. But how else are we to create those weird and bizarre boots or shoes that artists so lovingly come up with (besides writing them nasty letters telling them to choose footwear you can buy in the store). 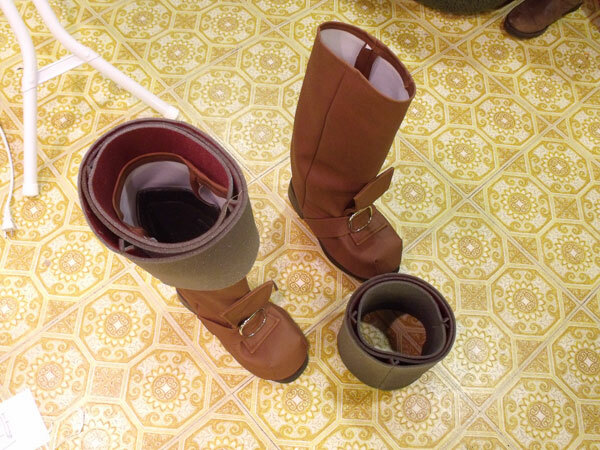 I've done a few boots over the past few costumes, and have sort of figured out how to make a decent boot cover, and attach it to a pair of shoes. This tutorial is designed to help you out with that. 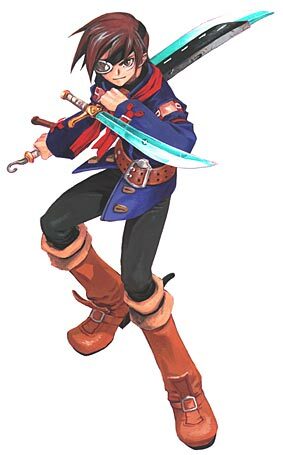 For this tutorial I'll be covering Vyse's Boots. Egads, where did you get those from Vyse?? As you can see, his boots are a tad....strange looking, and really, I don't think you could find boots that look like that in ANY store. Naturally, I was UP FOR THE CHALLENGE. (That and I said I'd have it done for Shuto Con in March). 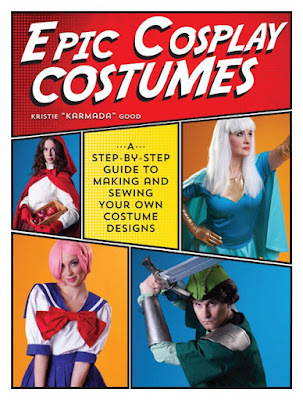 Before I even start cutting out any fabric, patterns, or what have you, there are a few important steps to take when making your costume's shoes. This is a very important step (especially if you are planning on entering in any sort of craftsmanship contest). You need good pictures of what your character's shoes look like. Searching the web looking for screenshots, or taking your own, or perhaps finding official artwork from the game. Namely, you want to find AUTHENTIC images. Fan art does NOT COUNT. 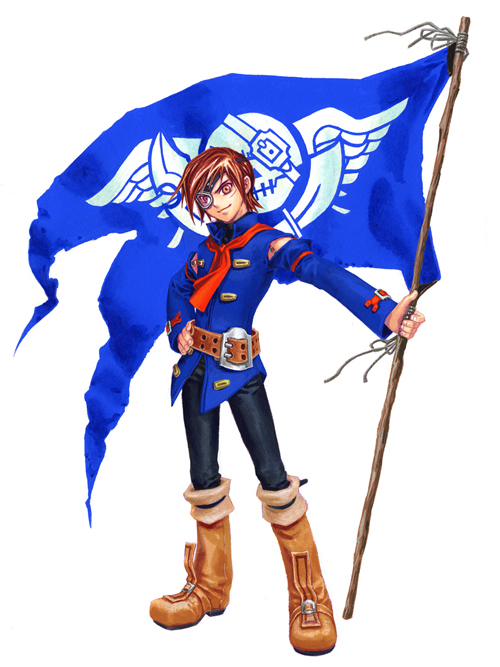 So I went about finding some shots of Vyse that I could find! I like to get all views I can of the outfit. Another official piece of Vyse artwork. 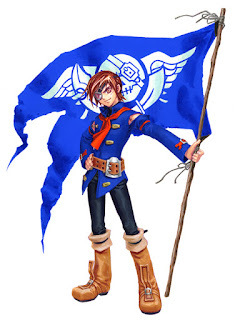 From these images (as well as turning on the gamecube and looking at the Vyse onscreen), I came to the conclusion that in every type of art, his shoes were slightly different shades of brown. On the bright side, this means I have a bit of a selection when it comes to choosing my pleather I plan on using. Bootcovers are exactly what they mean. They are covers you place overtop of boots (or shoes) to give it the effect of being an entirely different shoe. Namely, you can't find them in the store as is. My favorite places to start looking are at the good ol' Salvation Army/Thrift Stores. You can find shoes dirt cheap, and that way you won't feel bad if you have to mutilate the shoe later (see step 3). You can buy shoes if you really want to, but I don't recommend it. You'll want to start searching early if you plan on getting shoes from a thrift store - as there is no standard "stock" of footwear. Me? Well, I happen to be a shoeaholic, so I just happened to have the exact boots available. Yes. I'm a loser. I collect thrift store shoes. Now it was time for me to start preparing my shoes for covering. Onto STEP 3. 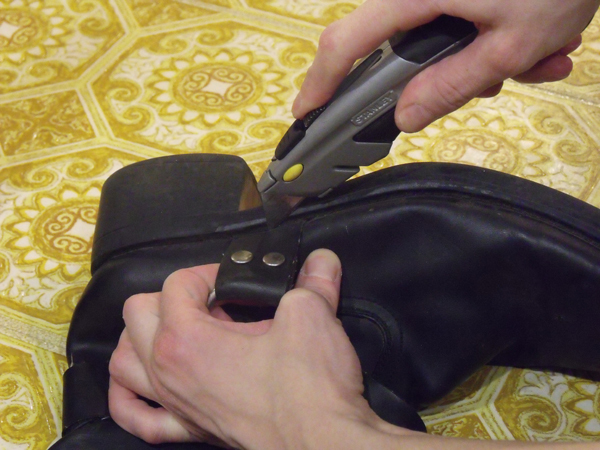 Probably one of the most important steps is getting your shoes prepared for covering. Depending on the shape of your shoe/boot, this could mean a lot of different things. In my case, I needed to get rid of all the extra strappy bits, so I had a clean surface to work on. And speaking of clean, I needed to wash down these boots, as whoever had them before apparently went TROMPING THROUGH MUD before donating them. I took a wet papertowel/cloth, and gently wiped down the boots. I wasn't too worried about destroying the boots, as I'll be covering them with an entirely new fabric. Next I had to remove all the little decorative bits. 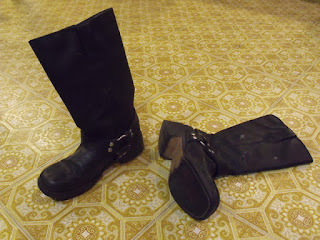 *SOB* I love harness boots, and it killed me to have to tear these off, but I did. See how far away my hand is from that blade? That's right, kids, SAFETY FIRST. I used a large utility blade to slice off the harness parts. BE CAREFUL. (I'm personally terrified of them, for reasons I shall not recant here, maybe at a later time). It took a few times going over, but I got them clean off. I also wanted to remove the little leather loops at the top, to make the sides as smooth as possible. I tried to use the utility blade, but after almost taking out a finger (again), I chose my heavy-duty fabric scissors. At this time, my boots were ready to go! 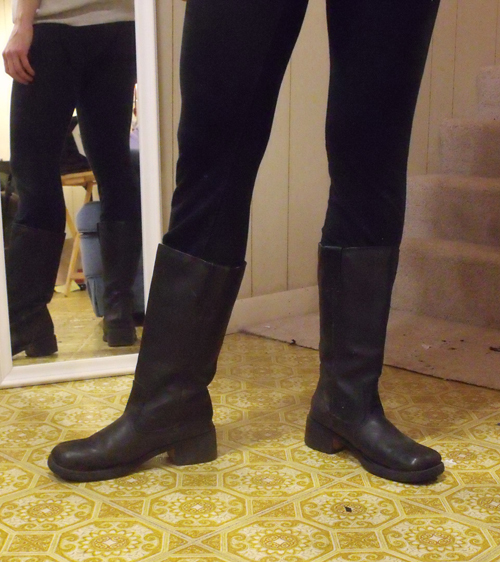 Now I was ready to start making my Vyse Boots! NEXT UP: Finding the Materials, Making the Boot Pattern, and Sewing the Bootcover (also known as, how to break your sewing machine in 3 easy steps). 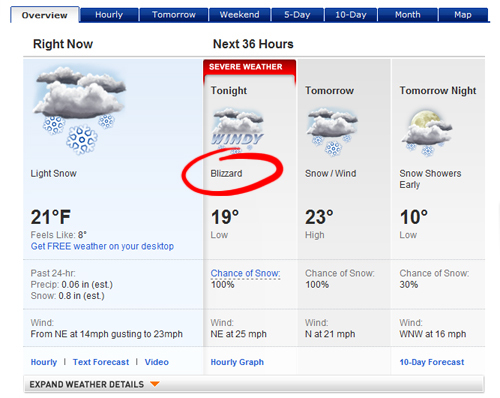 Snowly Crap! ...and some classwork! In case you've been living under a rock, or perhaps the upper western states of USA, we're apparently experiencing SNOWMAGEDDON 2011. Apparently this will be a giant snow storm of hideously epic proportions that you only see in movies like, "The Day After Tomorrow" or something. Every times the weather has said this, we get like 1 inch of snow, and everybody's closed, so you're home, and can't go ANYWHERE even though it's nice out. And for anybody who knows Michigan (the lovely state in which I reside), you'll know our news stations like to hype it up, so pardon my cynicism. However, this time...this time they might be right. I mean, when the NOAA says it's gonna be bad...they're usually right. Well, Vyse is coming along (after solving my blasted canvas problem). I should have some more pics in the next day or two - I had to take a short costuming hiatus to do a bit of work for a.) My online comic, "Sky's End" and b.) My Graphic Novel Class. Yes. You heard me GRAPHIC NOVEL CLASS. 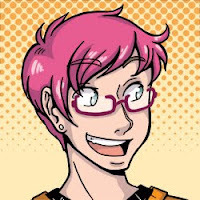 I'm taking an adult-ed class at our local Art college (center for creative studies), and we get to design, write, and print our own short comic book. For those uninitiated, I've been drawing for like, well, EVER. However, I'm very much MEH when it comes to digital stuff. Namely because it's daunting, and I can't seem to get anybody to tell me their tricks. I think the class has been helping, so there may be doodles appearing now and again. I did all this in about 1.5 hours of work. There may be help for me yet!